King Conan travels to the exotic land of Khitai, only to run afoul of an evil sorcerer and his demonic retainers in this tale of silent shadow warriors and ghastly monsters in the Far East. When Conan receives an invitation from the eastern kingdom of Khitai to open trade in precious jewels and spices, he decides that he will travel into this mysterious land. Yet to do so is perilous, as those who have requested his company may have far more devious intentions, and beasts unseen by western eyes lurk amidst the shadows. With words by fan-favorite scribe Akira Yoshida (X-Men/Fantastic Four, Wolverine: Soultaker, Elektra: The Hand) and pictures by Paul Lee (Detective Comics, Buffy the Vampire Slayer, Lurid), the entire series is topped off with covers by Pat Lee (Transformers, Darkminds, Warlands). 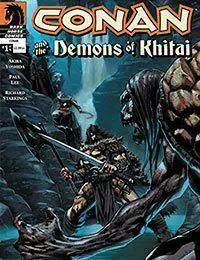 Set many years in the future of the award-winning ongoing Conan series, Conan and the Demons of Khitai marks Conans first appearance as king in Dark Horses best-selling comics revival of the legendary fantasy hero.